Thankfully, attitudes towards mental health problems are changing. As society is becoming more informed, the stigma of mental illness is diminishing, however there is still much to be learned about mental illness detection and treatment. True Mental Health Awareness must begin with the definition of mental health and an understanding that mental health is as real and as important as physical health. Like your physical health, your mental health doesn’t always stay the same. It can change as circumstances change and as you move through different stages of your life. While we all have times when our mental health is not optimal, for most those periods pass. For some, however, mental health problems develop into something more serious and life-altering. Since fear of discrimination and misunderstanding are often the reasons one doesn’t seek help, societal recognition, acceptance and support contribute to successful recovery from mental illnesses. Recognizing the signs and symptoms of mental health disorders and seeking treatment early on is important. Friends, family and the community can aid by first dismissing preconceived notions about the mentally ill.
1 in 4 adults−approximately 61.5 million Americans−experience mental illness in a given year; 1 in 17−about 13.6 million−live with a serious mental illness such as schizophrenia, major depression or bipolar disorder. Approximately 50 percent of students aged 14 and older who are living with a mental illness drop out of high school – the highest dropout rate of any disability group – and 73 percent of those who drop out are arrested within five years. Suicide is the tenth leading cause of death in the U.S. (more common than homicide) and the third leading cause of death for ages 15 to 24 years. More than 90 percent of those who die by suicide had one or more mental disorders. Every day in the United States, 11 youth under the age of 24 will end their life. What can you do to raise awareness and promote good mental health? Learn the warning signs of mental health disorders. Avoid using negative labels for mental health disorders – fear of discrimination and exclusion is one reason sufferers avoid getting help. Be available – Listen to others; encouraging and supportive. Value yourself and others – Accept the unique-ness of each individual, including your own. Be proud of who you are and what you have to contribute to the world. Recognize and accept your own, an others’ short-comings, but focus on what one can do well. Good self-esteem helps one cope when life takes a difficult turn. Take care of yourself physically and encourage others to do the same; eat well, avoid too much alcohol, cigarettes and drugs, exercise and get enough rest/sleep. Encourage a good support network – socialize and seek friend/family relationships. Help others – Helping others boosts self-esteem, helps us to see life and our own problems from a different perspective, and makes one feel needed and valued. Learn, and teach to others, stress relief and coping skills – stress is inevitable; coping with stress appropriately is essential to good mental health. Set realistic life goals, don’t overschedule yourself, or set unrealistic expectations of others. Join the Mental Health Awareness Month! Download this image, tag @idrive_LIVE and share on Instagram. 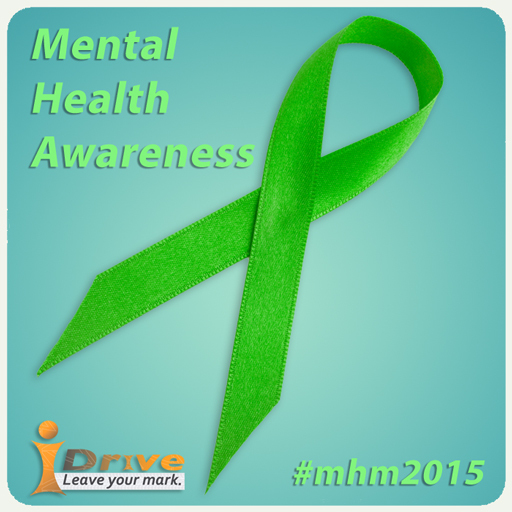 Use the official Mental Health Awareness Month hashtag #mhm2015 to participate. Have mental health issues affected you or someone you know share your story, e-mail us at advisoryboard@isafe.org. You can remain anonymous if you wish.